Richard has been advising and representing public education agencies since 1971. A skilled litigator, counselor, and highly respected labor negotiator, Richard has practiced before state and federal courts and administrative agencies, including extensive practice before the Public Employment Relations Board. He has substantial experience in negotiations and in student rights issues and also on a wide variety of personnel and labor relations issues. Richard is known throughout California for his expertise regarding school law issues and is a frequent speaker on such issues. 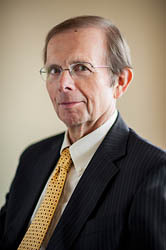 Prior to founding Currier & Hudson in 1997 with C. Anne Hudson, Richard was a shareholder in the law firm now known as Littler where he practiced public sector law for seventeen years, first in San Francisco and then in San Diego where he established an extensive statewide practice representing school employers on a variety of issues and in a variety of forums. Richard graduated with honors from Kenyon College with a B.A. in Chemistry. He attended Law School at the University of Louisville, and then earned a Doctorate in Education from Indiana University.